Saint Louis Armstrong Beach by Brenda Woods. Grades 4-6. Penguin, September 2011. 144 pages. Review copy provided by my local library. Hurricane Katrina is coming and nothing will stop her. But Saint Louis Armstrong Beach doesn't really believe that it could be all that bad. After all, New Orleans has weathered many a hurricane in its day. So he keeps on playing music on the streets to raise money for Julliard someday and when his dog runs away, Saint goes back to find him... and finds himself in the middle of the worst storm of his life. I've reviewed a few Hurricane Katrina novels that have come out for kids and teens over the past few years. There was Hurricane Song by Paul Volponi, which put teenage Miles in the middle of the Superdome. There was the superb Ninth Ward by Jewell Parker Rhodes, which painted a sensory picture of 12-year-old Lanesha going through the storm. And this year, we have Saint Louis Armstrong Beach. One definite strength of this book is that it's very kid-friendly. Yes, the storm's coming and yes it's seriously, but Brenda Woods focuses on Saint's life before and after the storm, rather than the horrors he's going through during the storm. This isn't to say that she brushes over everything, but there's a definite emphasis on living through it - that life was happening in New Orleans before the hurricane and that life went on in New Orleans afterwards. Having visited New Orleans this summer and having seen how the city is absolutely infused with music, I was very pleased to see that music is a big part of the story. Another aspect of the story that I was pleased to see was Saint's relationship with his former best friend, an older girl who lives next door. They're reaching those tween years when so many boy-girl friendships get awkward as new feelings develop. I feel like we get this scenario all the time from the girl's perspective, so it was refreshing to see it from a boy's view, even though it wasn't entirely successful. There's a lot going on in the book - Saint's music, Saint's attempt to save his dog, the coming storm, the girl-next-door-best-friend, another girl who has a crush on Saint... Some of the plot elements didn't seem to go anywhere and there were spots where I definitely had to stretch my suspension of disbelief to buy everything that was going on. That said, this is a nice addition to the Hurricane Katrina books available for kids. It will make the storm accessible to elementary school kids and is perfectly appropriate for the classroom or library. 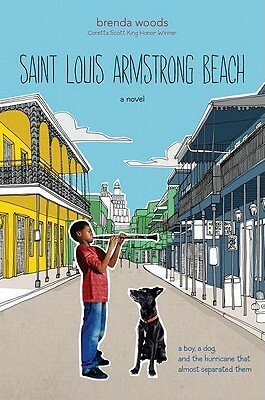 Saint Louis Armstrong Beach is on shelves now!